The United Cardinal Bloggers are dedicating June 6 to the memory of the Cardinals’ No. 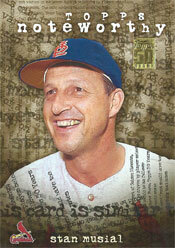 6, the late Stan Musial. In that spirit, this post will review the 6 best games Musial had on the sixth day of the sixth month during his major-league career. 1. _ Braves 9, Cardinals 5, June 6, 1946, at St. Louis: The big news came just before the Cardinals took the field when Musial informed reporters he had rejected a five-year contract offer from the Mexican League. Musial met that day with Alfonso Pasquel, one of five brothers who operated the Mexican League, and Mickey Owen, the former big-league catcher who was working for the Mexicans. Musial told the Associated Press the Mexicans offered him “a lot of money,” later reported to be a package of at least $175,000. 2. _ Cardinals 5, Phillies 4, June 6, 1952, at St. Louis: Musial, batting third and playing center field, was 2-for-2 with two walks and two runs scored. 3. _ Dodgers 5, Cardinals 4, June 6, 1953, at Brooklyn: Musial produced a RBI-single and scored in a three-run Cardinals fourth inning against starter Johnny Podres. Batting third and playing left field, Musial also singled in the ninth off Clem Labine. 4. _ Phillies 11, Cardinals 8, June 6, 1954, at St. Louis: Musial singled in each of his three at-bats against starter Curt Simmons. Musial was a .360 hitter (50-for-139) with 18 walks in his career against Simmons, a left-hander who became Musial’s teammate from 1960-63. With the 2-for-4 performance, Musial regained the National League batting lead at .362. He also took the league RBI lead, with 39. Musial in 1957 would win his seventh and final National League batting title with a .351 average, 18 points ahead of the runner-up, Willie Mays of the Giants. Musial also finished tied with Ernie Banks of the Cubs for third in RBI at 102, 30 behind leader Hank Aaron of the Braves and three behind runner-up Del Ennis of the Cardinals. 6. _ Cardinals 4, Reds 3, June 6, 1962, at St. Louis: Batting fourth and playing left field, Musial had a pair of singles against starter Joey Jay.